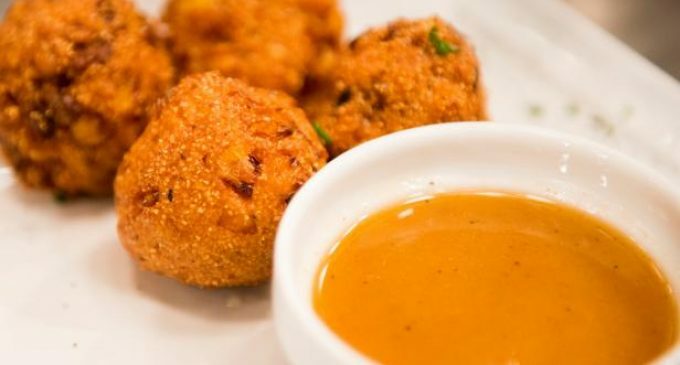 Hushpuppies are a mainstay of Southern cuisine, these bite-sized fritters are made from a corn base and fried in hot oil until they're crispy, savory and just downright delicious. They're a classic comfort food and one of our top indulgences. They're even better when paired with the right dipping sauce. This recipe, however, puts a whole new spin on this beloved South snack, and believe us when say this updated version is absolutely amazing! This Southern Staple Just Got A Hot & Spicy Upgrade! This version uses the traditional corn recipe but adds some bacon for an extra pop of flavor. And boy does the bacon make all the difference. These hushpuppies turned out incredibly savory and hearty! As if that wasn't enough, there's also a sweet, spicy sriracha dipping sauce that takes an amazing dish to an out of this world experience. The sauce is a little sweet and a whole lot fiery, and we just can't get enough of it!